A great dance teacher is somebody who not only teaches the student, but inspires the student. 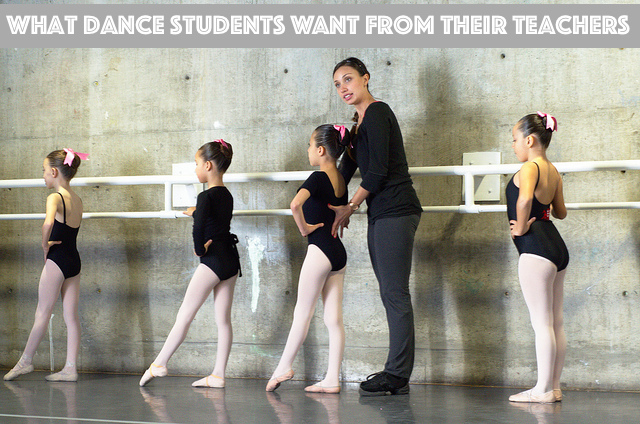 A student’s future and potentially his or her professional career is riding on the instruction a dance teacher gives. Therefore, a good teacher-student relationship is a necessity for quick improvement and healthy development as a dancer. Everyone loves a teacher who gives them lots of corrections. As a student, I find it very appealing to see a teacher constantly working with us and helping to develop our technique. I love it if, at the barre, the teacher walks around the room during the combination and gives 1-2 personal corrections to everyone in the class. That’s how we learn best! The best teachers are not only ones who give lots of corrections, but give corrections relevant to dance as a whole. For example, instead of saying after a dégagé combination, “In this combination, I showed the accent out. Most did the accent in,” you could say, “Make sure you are showing the accent out. Always pay attention to where the teacher puts the accent as they show the combination.” We can then apply this to other classes. 3. Something to work on each time. Going into a combination without a focus point or idea of what we should be working on can be difficult for a student to manage, and our minds tend to drift. If you give a correction pre-combination, such as: “Focus on initiating the dégagé with the heel,” we are more likely to be actively improving our technique by thinking specifically. 4. The how, not just the what. If a teacher tells us how to manage a certain step rather than just what the right way is, we can learn from it and we find it easier to apply the correction. Vague or oblique corrections can be disappointing and difficult. We appreciate it if teachers use phrases relating to imagery, anatomy, or the intention of the terminology or style of the step. 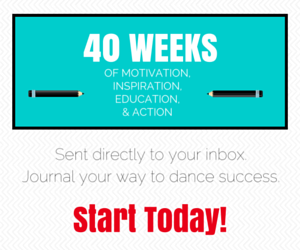 This article on Dance Advantage about rephrasing corrections gives examples. If a student is not applying a correction very well, we love it if a teacher will try to say it in a different way and see if that makes sense with the student. Especially if it involves imagery – the same image might not work for everyone! It’s really important to be versatile and understanding. 6. The opportunity to ask questions. Especially if the teacher is new or a guest, it’s important to ask us if we have questions about the combination. Some teachers find it disrespectful or negative if we have questions, and others love it. If you specify, we won’t be scared to ask if we do have a question! If you regularly teach the same class and the students already know the policy, it’s fine if you don’t ask before every combination. Even if we look disappointed, or you feel like you are letting us down, we appreciate what you do so, so much. We wouldn’t be the dancers we are today without you, and we really appreciate the hard work and dedication you put into preparing our classes for us. Thank you for doing what you do! 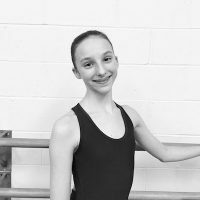 Ella Marie Goulet is a 13-year old dance student attending the Grand Rapids Ballet School in Michigan. She has been dancing for 11 years and en pointe for 2. She runs a blog about dance and lifestyle advice and experiences at gouletballet.com. Follow her on Instagram (@ellagoulet) and her blog’s Instagram (@gouletballet). Thank you, Ella, for the feedback about giving feedback! Good luck in your studies! Your knowledge and confidence shine through in your writing. An excellent article. I especially like 3. I find it frustrating to be given a correction at the end of an exercise and then moving on to another exercise without having chance to put that correction into use and getting it into muscle memory. By the end of class I have forgotten what the correction was and the following class make the same error again. Giving the correction first or repeating the exercise after the correction really helps me to improve.